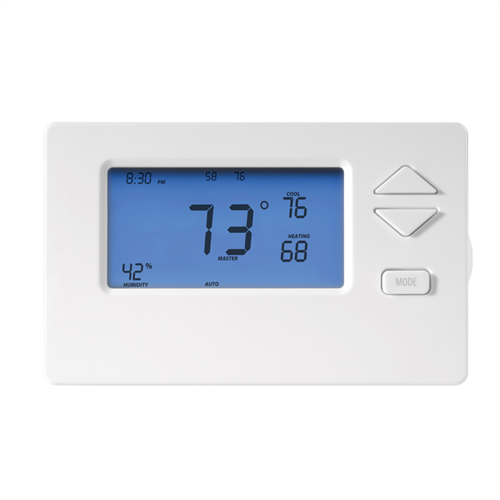 The 2441TH is an INSTEON enabled programmable thermostat supporting standard single or two stage heating and single or two stage air conditioning. It is fully functional as a standalone thermostat with local control and 7 day / 4 event programming, but the real power is achieved when included in an INSTEON automation network, allowing remote control and remote scheduling. As an INSTEON wireless device it can be controlled directly by INSTEON wireless devices such as a RemoteLinc or RemoteLinc2 so you can adjust temperatures just by pressing a button on your remote. It can also be controlled by wired INSTEON devices as long as you have at least one access point or dual-band device within range. Add a SmartLinc for remote access and monitoring from your iPhone, Android or Android device. Or with advanced controllers such as ISY99 series, you will be able to create advanced schedules or receive e-mail alerts when temperatures hit a high or low point. The 2441TH can also be an INSTEON CONTROLLER. Link it to other Insteon devices to automatically trigger ceiling fans or dehumidifiers based on temperature or humidity. You can even control lights based on one of the daily schedules such as RETURN mode so that outside lights turn on automatically.